The colour puple was the fashionable shade at a fundraising party helpd by a Tadcaster woman last weekend. 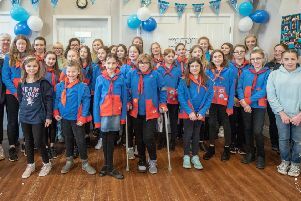 Photographer Rachel Stewart is in remission from lymphoma for a third time and organised a fundraising party with family and friends to bring in nearly £1,000 for the Lymphoma Association and Bloodwise last weekend. The mini festival, Rachel called The Purple Standing, was held in her garden and featured a DJ, glitter face painting, a bubble machine and the garden decorated in purple. Rachel plans to hold more fundraising events to help boost the charities after having numerous treatments for Hodgkin Lymphoma which was first diagnosed seven years ago but returned. “Having has lymphoma three times this is clearly very close to my heart and following a third remission I feel it’s time to give back,” added Rachel, who taught herself photography and launched her own business after her first battle with lymphoma.